Peace. It’s what we all want, right? The problem is that we have to fight to get that peace, which feels like we’re going in circles. Every parent feels this way from time-to-time; like we’re running around all crazed and nothing is getting done while a tornado of “to-do” stuff is tearing everything apart around us and no-one can see it happening. One day, I suddenly realized that I was my own worst enemy when it came to achieving this peace. I can’t remember the exact day, but in my tornado of craziness, a day came about that I had this realization. I’m sure I was wearing two-day old, stained sweatpants and my hair was in messy pigtails. Whatever I was wearing, it doesn’t matter, because this was the day that I decided that I couldn’t raise my daughter all on my own. I also have an incredible support network made up of church family, relatives, teachers and friends. I’m one of the lucky ones, and I definitely know it. God bless all of those amazing people. My realization was that I was trying so hard to not bother my loved ones by asking for help, and in doing so, I was causing myself to have an emotional, physical and mental breakdown. I started having seizures because I was only getting about two hours of sleep a night. My body decided to send me a message that I could no longer ignore. I needed help. I needed to give myself a break. If I didn’t, it would be detrimental to my health and my family. That was the last thing I wanted to happen, so I decided that I needed to make a change. I asked one of my friends to help me find a local camp that Lexi, my then 10-year-old daughter, could go to. I wondered if such a place even existed. It needed to have nursing care, one-on-one direct care, and a deep understanding of what it is like to work with a child who is severely cognitively impaired, non-verbal, physically impaired, with a seizure disorder, Down syndrome and autism. That’s a lot to put on someone you don’t know and it’s very scary. Like cry yourself to sleep terrifying, which I did multiple times. My friend, Michelle, immediately found a place called Saint Francis Camp On the Lake. It was only an hour and a half from our home, was very affordable, and even offered scholarships. Most importantly, it seemed to offer all of the things I was looking for. I started to research this place with great trepidation. This was my child’s life and safety I was dealing with. That’s not something that any mother would take lightly. I called and talked to the director of the camp, another Michelle (that must be a magical name), and she was amazingly helpful and reassuring. That right there made me feel like this might the right choice for our family. I then drove out to tour the facility and see what I thought. It really was love at first sight. It was small, enclosed, beautiful, and the workers and children seemed to be having the time of their lives. Again, much needed affirmation that this was the right thing to do. It took a while to fill out the applications, find financial assistance, and actually get the courage to sign my daughter up. When the time came I wasn’t sure that I could actually follow through. I sobbed the entire drive there and back, not to mention crying on Michelle’s shoulder when I got there and another’s friend’s shoulder on the way home (Thanks again, Jen). The first time was a little rough. Not really on Lexi, but on me. I cried every day and emailed the camp director about four times a day to check in. Thank goodness she had the patience of a saint. The second time was easier and the third time was excellent. Now we drop Lexi off and she barely hugs us goodbye before latching on to her counselor and heading to her dorm. Enter more tears from mama. They dried pretty quickly that time, however, and were, for the most part, were tears of joy. I know that sending your child away to be taken care of by someone else is one of the scariest things a parent will ever experience. I’m talking can’t catch your breath, paralyzing, nightmare giving, crying to your mom on the phone, panic attack causing fear. We’ve all been there, but when your child is on the autism spectrum and is non-verbal, those fears are magnified by about a billion. I will tell you this, though; I have zero regrets about the choice I made that day. I am a much more sane and balanced person now that I have given myself permission to take a break. I’m a better wife, mother, sister, daughter, employee and friend because I actually take time for me once in awhile. I can give more of myself to charities and other families who are dealing with these situations, which is the cry of my heart. A few weeks ago I able to sit down with Michelle, my new friend and the director of the camp that my daughter now attends. I asked her about how she got started in this type of work. It takes a person with great character, an unbreakable spirit, and a heart overflowing with love to do so. They are rare, these God-sent people, and I thank Him every day for putting them in our lives. A few of the things that Michelle had to say really touched my heart. One of the first things she said was the only barriers are the barriers we place on ourselves. Oh goodness, ain’t that the truth? I was placing barriers on mine and Lexi’s lives by not being willing to even consider the possibility that a place like Saint Francis even existed. Another barrier was that I was too afraid to let anyone other than myself take care of my daughter. Finally, and most importantly, I was holding my daughter back from experiencing the world and growing. I thought I just protecting her, which I was of course, but it dawned on me that I was keeping her from growing as well. That one hurt. More tears. I’m kind of an emotional person if you haven’t figured it out by now. Ah, well. It’s all part of the crazy package that is me. My friend said one more thing that still makes me tear up a bit when I think about it. (See? Crazy emotional lady in aisle three. She’s opened up a box of tissues, grabbed a fluffy blanket from household items and is dipping Oreos in a mug of milk while talking to herself. Oy vey.) Anyway, the second thing that Michelle said which really caught my attention was this: For as long as she could remember, she has always been motivated to push boundaries. It actually hurts her when she sees people dismissing our loved ones on the spectrum and putting them aside. She sees what other people don’t. And you know what? There are actually a lot more people like her in this nutso world. They may even outnumber the bad ones, believe it or not. Here’s what it all boils down to That peace that we all want? That peace that we so desperately crave? People like Michelle are offering us that peace with open arms. We just have to stop being our own worst enemies and accept it. We begin this acceptance by starting the process of letting someone else care for our children once in awhile. It might be a grandma, an auntie, or a trusted friend. It might be a respite worker for a couple of hours here and there. It also might be a camp stay for a week at a time. It might even be… hold on now… don’t get scared… someday, down the road, an adult group home. I’m talking way down the road. Like years, baby. Don’t start stressing on me. Now, I know that a majority of you will have about a thousand reasons for why what I’m saying is nonsense. That I don’t know your story. That your case is different than mine. You know what? You’re right. I don’t know your story. 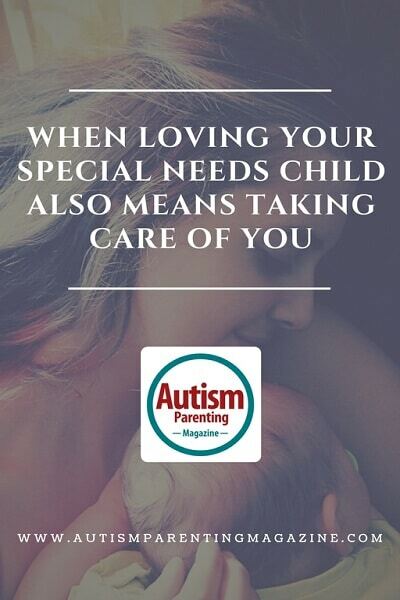 I would never in a million years presume to know what you’re going through, just because we both have a child on the spectrum. However, please consider this. Of all people, I probably do know what it’s like to actually walk a mile in your shoes. Do we go through the exact same struggles? No. Of course not. Do I know every facet of the fears you feel and worries that take your sleep away at night. No. I couldn’t possibly. I would never presume to say that I do. But I can empathize deeply. And I do. From one worn out mama to another, let me tell you that you do deserve a break. You deserve to take a breath so that you can come back refreshed and ready to go, a better mama than ever. As a semi-experienced mama, I can say that your child deserves a chance to get out in the world, to learn and explore and grow. It will be good for both the child and you. I’m not trying to pressure you, but I am trying to make you think. I am giving you permission to give yourself a break for once. It actually isn’t selfish. A break is in your best interest, and therefore in the best interest of your child. Whatever you decide, please know this: What we do is so freaking hard. Like, pull your hair out, desperately need a vacation, or at least a long soak in the tub with a bottle of wine kind of hard. Your deserve a break and you deserve some peace. So does your kiddo. Places like camp can provide just that. If nothing else, do the research and see what’s available in your area. Believe me, it took me years to work myself up to stuff like this. Like, literally years. Let me end by saying this: We are all experiencing our own journey, but that doesn’t mean that we have to take separate paths. Let’s travel together. We’ll meet people like Michelle on the way and have some great laughs. If nothing else, at least we won’t feel alone. And you’re not alone. Thanks for listening to me and I hope I didn’t push too hard. It’s just because I care. Till we meet again, new friends. Emily Davidson is married and is the mother of three children, residing in Kalamazoo, MI. She is a classically trained pianist by trade. Her oldest child, Alexis, has multiple diagnoses, including Down syndrome, West syndrome, and autism. You captured the challenge that so many families I support are dealing with. They recognize that they need a break and peace but “Break” and “Peace” seem like tropical islands millions of miles away. Additionally, it can be hard to recognize what the barriers truly are, compared to the ones that are imagined to be there (without data or evidence to confirm they are really there). Thanks for sharing your story of the work you put in up front to get to your place of peace, as well as finding opportunities for you and your daughter. I know many parents who will benefit from reading this.